WhatsApp remains one of the most popular cross-messaging platforms across the world. It is free to use and allows users to send and receive text messages, audio, videos, documents and images. Now, it is important to safeguard the data you have shared with others on WhatsApp. 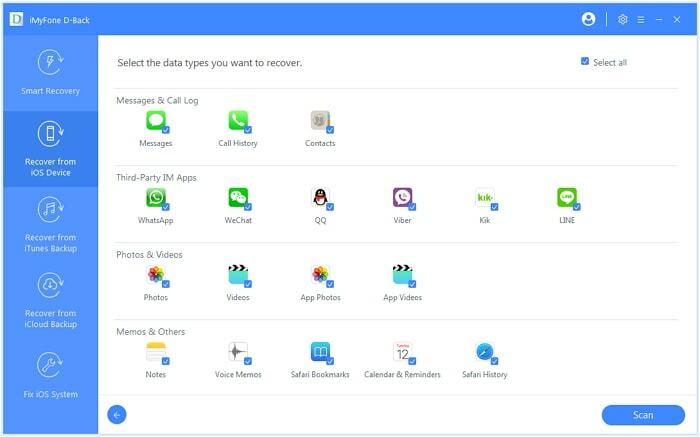 Because of numerous reasons, you can lose your WhatsApp data from your device. So, it is vital to take online backup of WhatsApp data, which can be accessed from any of your primary devices in future. In case you lose your phone or accidentally delete the data, WhatsApp online backup can come in handy to access them. Local backups are common in WhatsApp even since it was first introduced to the public. Having the backup on Cloud or other storage devices will be helpful to the users because of various reasons. Every day you exchange lots of data on WhatsApp and the app itself back up the data on your device. But you could lose all your data, in case your phone gets damaged, changed or lost. If you have the copy of WhatsApp data, you could easily bring it back. There are various ways to take the back up of your WhatsApp data, one being the local backup on your device. You can also back up the WhatsApp data on your desktop. If you are looking to securely backup the data of your iPhone, there is a better alternative than the stock options of taking online backups. iMyFone D-Back is a top-notch program to backup the WhatsApp data. With this data recovery tool, you can conveniently take the WhatsApp online backup without compromising the privacy of your text messages, audio and video files. 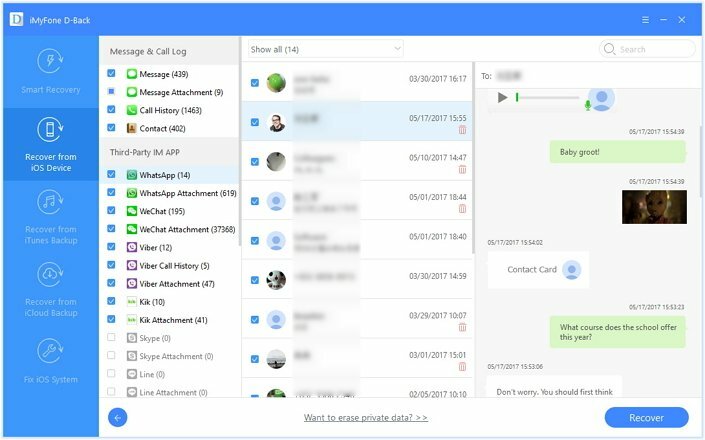 Supports more than 18 data types including WhatsApp messages and attachments. Does not affect your other backups. There’s no storage limit which means you can backup as much data as you want. Supports to selectively or fully back up WhatsApp messages you need. Step 1.Launch the iMyFone D-Back program on your iPhone, tap on “Recover from iOS Device” and then tap on “Start”. Step 2.Connect iPhone to computer and wait for the software to detect it, then click on “Next”. Step 3.Select WhatsApp data type you need to back up and then click on “Scan”. Step 4. Once the data is scanned, you can select what you need and choose a location where you want your files to be saved. You can also use iCloud to back up the WhatsApp data. The chat messages are not stored on WhatsApp servers so relying on iCloud backup is safer and more convenient for backup. You can manually back up the WhatsApp data on your device in simple steps. Ensure that iCloud Drive is turned on in Settings. Step 1. Open WhatsApp and then go to Settings. Step 2. Select Chats and then Chat Backup. Choose Backup Now to backup all the WhatsApp data. Step 3. If you want to back up the data automatically, choose Auto Backup and choose the backup frequency as you wish. Step 4. The WhatsApp data will get stored on your iCloud account after the process completes. 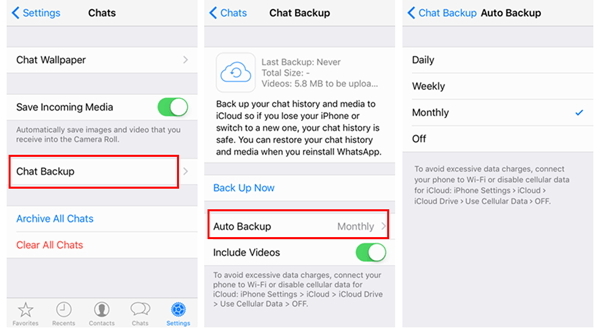 Instead of making a backup of just your WhatsApp data, you can make a full iCloud backup of your iPhone. In case your device gets stolen, lost or damaged, you can have a copy of your device’s data including the WhatsApp data. Before you start the iCloud backup process, make sure that your device is connected to the internet. Step 1. Open Settings, choose your name and then tap iCloud. Step 2. Tap iCloud Backup and then tap Back Up Now. Step 3. The backup process will complete depending on the size and strength of the internet connection. Step 4. Once the process completes, you can check the last Backup in your device’s Settings. Once you backup the WhatsApp data to iCloud, you don't have to worry about losing your important conversations or files even if your device is lost, stolen or damaged. 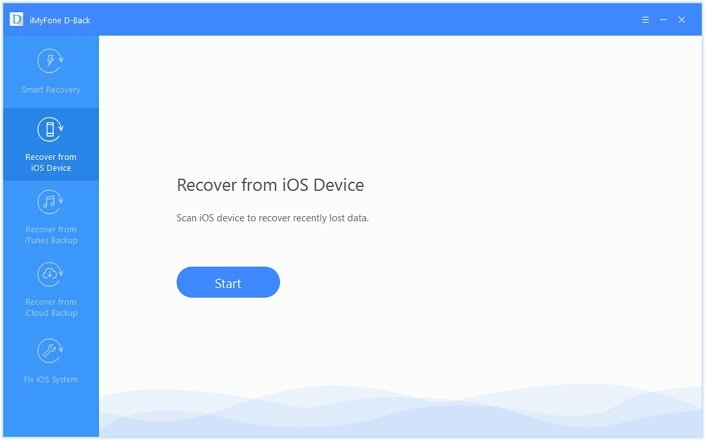 iMyFone D-Back recovery tool offers the easiest way to backup WhatsApp data. 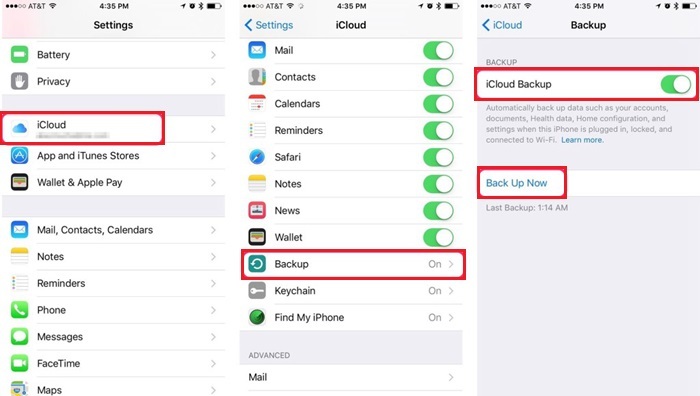 You can use any of the four modes of iMyFone D-Back to backup data of iPhone to computer. Creating iCloud backup is a boon to many users as it allows them to back up the entire data of their device. However, the data is saved only in the iCloud account of the user. You can lose the data if you forget the ID and password of your account. 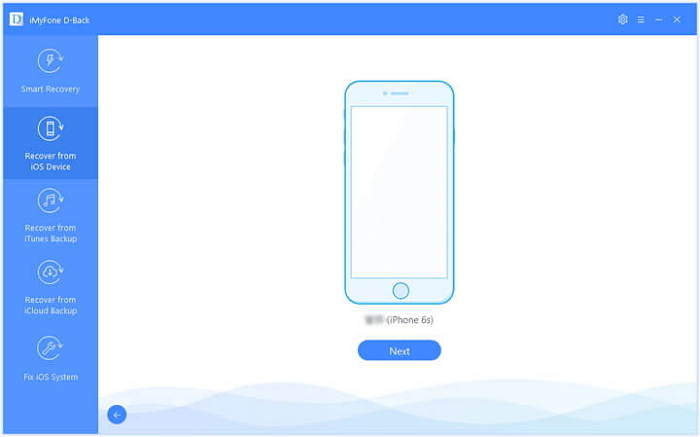 iMyFone D-Back allows the users to save the data outside the device and cloud. You can just save them locally. Before deciding to choose, just view all the pros and cons of the different methods. It can’t be more careful with your important WhatsApp data. Leave us a comment about your own experience.